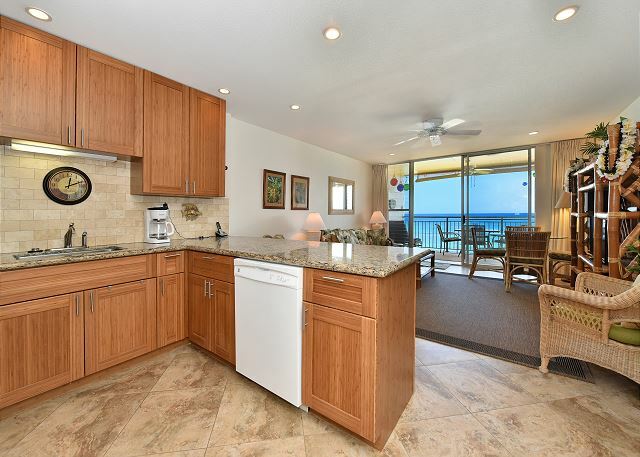 Makani Sands condo #203 is a one bedroom on the 2nd floor. 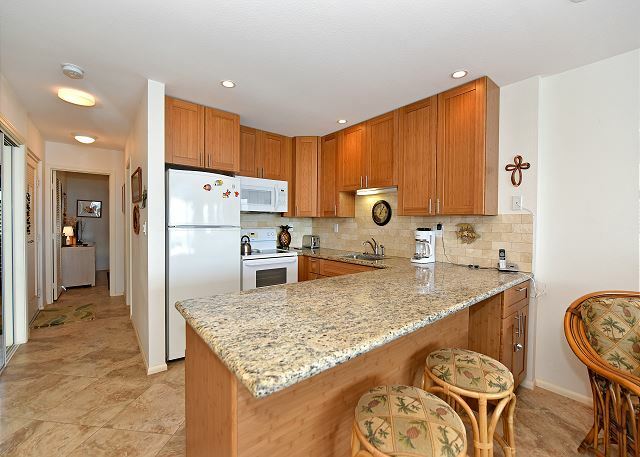 This condo is beautifully decorated in the Hawaiian style with all the comforts of home. There is a full kitchen and all the necessary appliances, conventional stove, and a microwave. 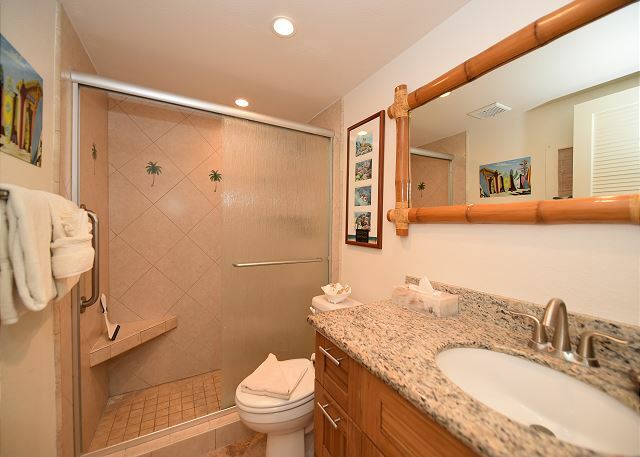 There is a beautifully remodeled bathroom with a walk-in shower. The bedroom has a king bed and a TV for your enjoyment. There is an outside lanai with table and chairs so you can sit outside and watch the sun set over our neighboring islands, Molokai & Lanai. The living room on the ocean side has a sofa bed for extra guests, TV, VCR/DVD and a CD player for your entertainment. 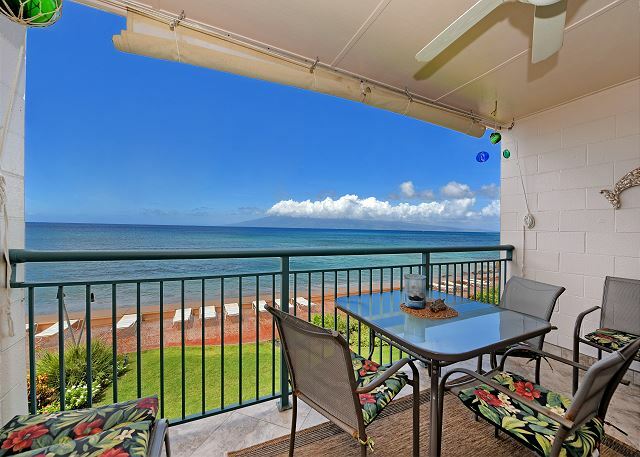 Stay in Makani Sands condo #203, and make it your home away from home on Maui! This is the second time we have stayed in 203. The ocean view is excellent, we like like the location, the staff is very friendly and helpful and go out of there way to help. 203 is nicely decorated and kept up, it is not noisy and feels very private. We will defiantly be back again. Everything needed for a vacation. Location was great not to far from anything. Kitchen was well supplied. Bed and pillows were comfortable. Having a private lanai with unobstructed ocean view was fab! Cooler, beach chairs etc was all available to use in near perfect condition. Marie the rental manger was great! Would recommend to anyone! We really enjoyed our stay at Makani Sands #203. We loved having breakfast and watching sunsets on the Lanai. The bed was very comfortable. The kitchen had everything we needed for cooking. 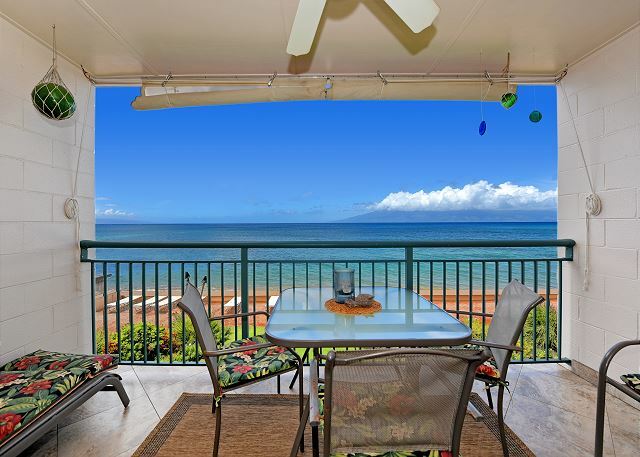 The condo was very clean, and the location is great, just a 5 minute drive to Kaanapali beach. The amenities were great, it came with a lot of nice beach gear, although we would have loved a cooler/ice chest to pack our lunches in for picnics on the beach. Everything else was great and we would love to stay there in the future. Tropical Home Away From Home! Our recent stay in unit 203 exceeded our expectations. This unit seems to have been beautifully renovated in recent years. 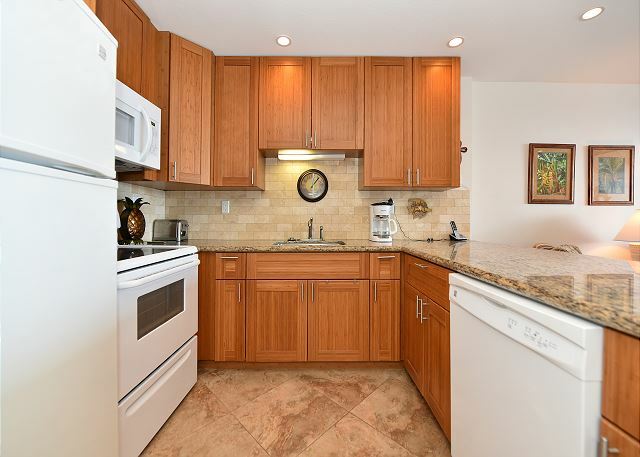 Well equipped with everything you need in the kitchen, in-suite laundry, wifi, nice tile floors throughout also carry onto the lanai. Gorgeous sunsets every night and good snorkeling right in front of condo. Loved to hear the sound of the waves and watch the honu swim out front. Although no a/c the trade winds blowing through the condo keep things very comfortable. Managers are super friendly and helpful. Gardens on the property were outstanding. If you want oceanfront this property will not disappoint. Can’t wait to visit again! Sharon and Bob H does not recommend this vacation rental. whoever designed this room was not thinking of the women in the room. the washer and dryer are a joke my wifes back is still sore from trying to get the washer door open. terrible. no place for groceries.the pullout couch is very uncomfortable. kids ran the place with no supervision from the parents or the mgr. grtied up the pool allday because there is nothing else for them to do.without a beach its not a great place for kids also very noisy in the b.r.from 5am on the office ladies were great and tried to be very helpful we have made at least 20 to 25 trips to the makani sands so we are not strangers there. its 50 years old and showing. First time stay at Makani Sands and definitely not the last time! This was our first time to stay at Makani Sands. We rented #203 in mid January. The moment we walked in to the condo we were blown away by the view from the lanai; this condo is right on the ocean. We could see two other islands (Lanai, Molokai), and observe whales, dolphins and sea turtles swimming by. 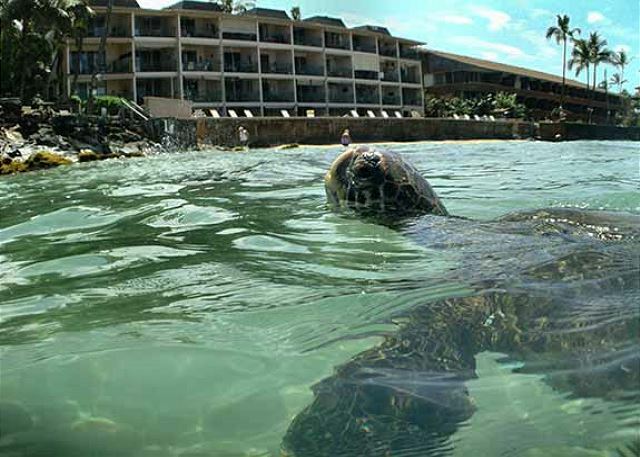 The condo was beautifully decorated and recently updated in Hawaiian décor with a theme for sea turtles which is so appropriate as I saw 6 swim by the first day we were there! The condo was clean and stocked with everything we needed to enjoy our stay. It was plenty spacious enough for 2-3 people. Nearby is the Farmers market with fresh local produce, jams, bread, etc. and a wonderful fish market with fresh catches each day. Whalers Village is also close for excellent shopping. The place is well maintained and the caretaker was a wealth of knowledge on the sea life, the ocean and local customs. We really never wanted to leave our place; whale watched all day, sunned ourselves and barbecued seafood every night as the sun set. We have already booked next year. Aloha! We love staying here, feels like our home away from home! A wonderful place to rest, relax and enjoy - all with a wonderful view of the ocean and the sound of waves lull you to sleep! And, your own beach steps away. a guest from Maple Grove, MN does not recommend this vacation rental. 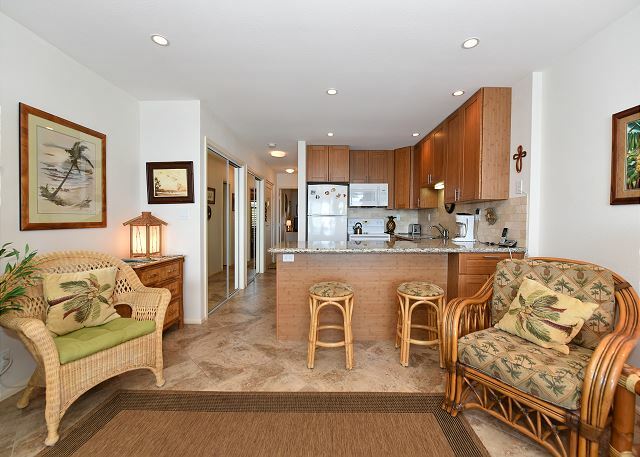 This was a pleasant beachfront condo in the Lahaina area near many attractions and restaurants. 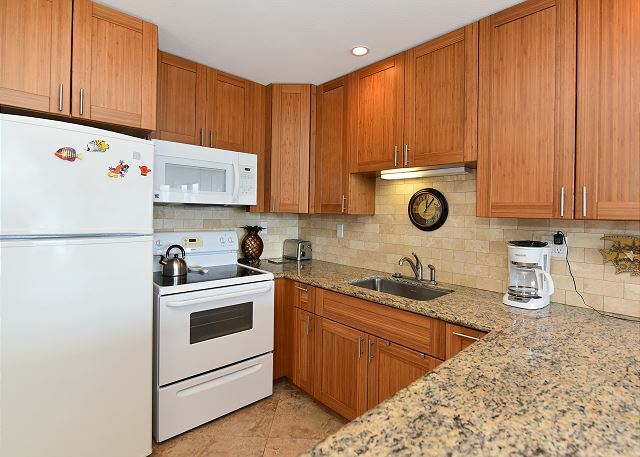 The condo was found to be very clean and included amenities necessary for a short stay. We arrived during high surf and the beach was practically unusable. The waves were very high and splashing above the deck area. Very pretty but if you want a beachy area I would look further. Another problem there is no AC and it was very warm when we stayed end of March. No breeze, no crosswinds to cool off condo. The bedroom is located in the front of the condo and mornings can be very noisy with traffic outside. If you are one that sleeps in past 7AM, again, I would suggest you search further. Unfortunately, we had a family emergency and had to leave the 2nd day of a 5 day stay. We informed the office Wenesday AM, 3/29/17, and were completely taken aback by the women in the office, She quickly advised us there would be no refund; they never give refunds. Absolutely no compassion for our situation! She was downright rude! We didn't really expect a refund but thought they would suggest trying to re-rent the condo and afford us some type of credit. Surprisingly, the Airline and Car Rental Agency were more sympathetic and gave us credit for days unused. We were totally disappointed in the way she handled the situation. Bert, the property manager, did show compassion and was sympathetic to our situation. Maybe the woman in the office could take a lesson from him. All in all, the property is nice and quite inexpensive for Hawaii. But do not look for luxury that you would find in a higher end condo or hotel. We love going to this condo location. These units are right on the ocean front with a small beach for the turtles to rest on until the next high tide. Everything was as we remembered. We had an excellent experience. We called several times to make changes and get updates. We were welcomed very nicely by the staff. We love it here as this is our 3rd stay at Makani Sands. If we get to Maui again we will return. We enjoyed this location and the property so much, we plan to return to Makani Sands on our next trip. 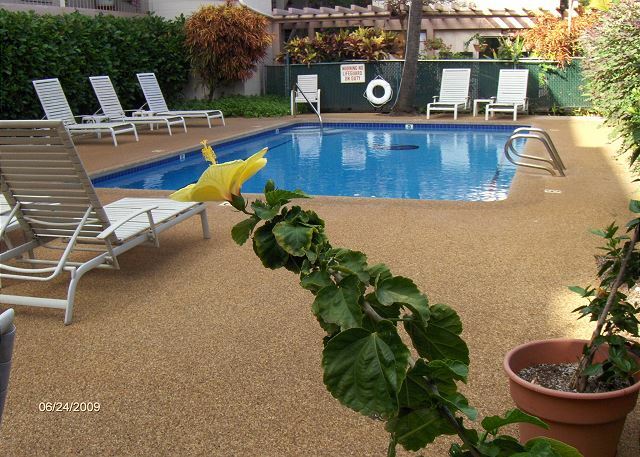 It's clean and comfortable and we like the beach town feel of Lahaina. Mahalo to staff, Marie and Burt, for adding to the experience! Ekaterina F from Northridge, CA does not recommend this vacation rental. A lot of fleas from first day we arrived. No cleaning service, like other condo's offers, not a swimming beach- sharp underwater stones, we had to drive to different beach. Rude management. We were dissatisfied (1). 9 Days. Nice accommodations, with an excellent view. I was aware that the beach was limited, but it turned out to be very swimable and folks of all ages were using it most days. Not sure it that is related to the time of year (June). Resort has a great pool on garden side of the development if the surf is a bit rough. Room had been updated, and was very comfortable with everything you would need for cooking and cocktails. Small complaint, we were there for 9 days; no maid service included till two weeks. Seemed a bit on cheap. Initially had to do some re-cleaning of kitchen items. But this was a small thing when compared to the view and comfort provided by the resort and staff. 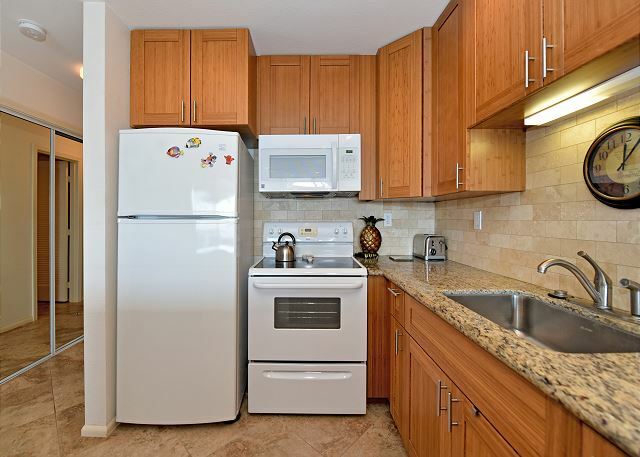 These are not high end condo's like Kapulua, but they are clean, nicely updated and all the comforts of home. We really enjoyed 203 it was very up to date and decorated nicely it was very comfortable. Everything was in working order. Burt the maintenance man is very hard working and friendly and helpful. It was a good price for being right on the ocean. It made the trip to Hawaii affordable and able to stay longer. It has been 15 years since we were there but it was our 5th visit. We have no interest in looking ar other properties because Makani Sands just feels right for us. Now that we are both retired we are going to consider an extended stay. We had an absolutely fantastic holiday at the Makani Sands!! The condo was exceptional!! It was very well kept and appointed. The location was exactly right for us. All the amenities needed for a home away from home. The staff was always very friendly and helpful with any questions or concerns. Everything about Makani Sands helped make our vacation truly memorable!! The only thing we found was that our king size bed was a bit too firm for our taste. 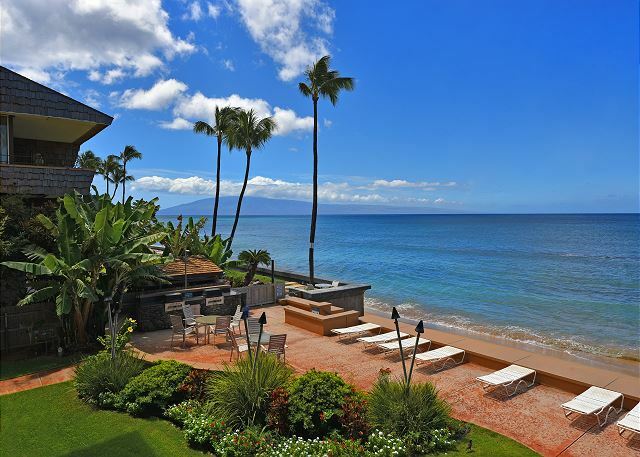 We will certainly be recommending this property to all our friends and family as the best place to stay in Maui. Our condo was well equipped and comfortable with great views and easy access to the beach. The staff was very helpful and many amenities were within walking distance. 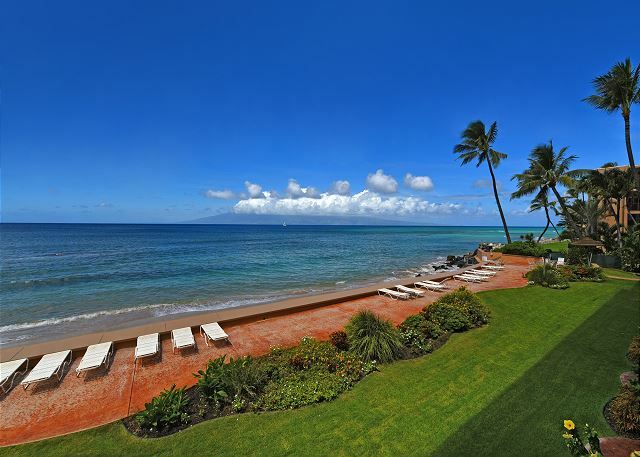 We had a wonderful stay at Makani Sands, we have been here several times and always enjoy our time on Maui! we have enjoyed the makani sands every winter since 1997. It is always an enjoyable experience. The condos are right on the water with beautiful views of the other islands. 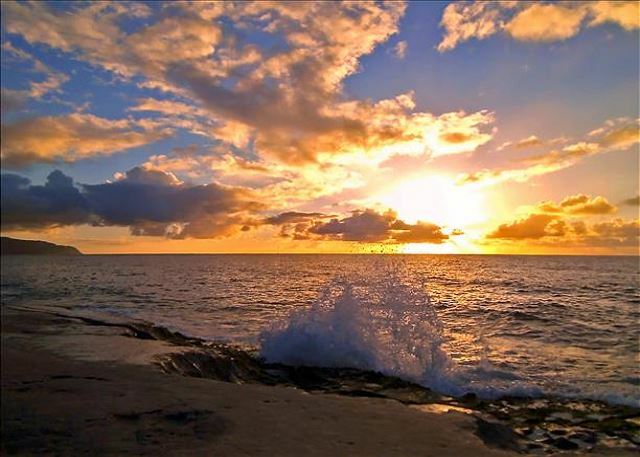 Turtles, whales, and fantastic sunsets. Roseanna is helpful making sure every guest is satisfied. For the past 25 years I have found it to be a true pace to go to and relax. Manager Roseanna is a key factor in providing good Customer Service. Our first time staying at Makani Sands. We are familiar with the ocean front condo area and enjoy it very much. 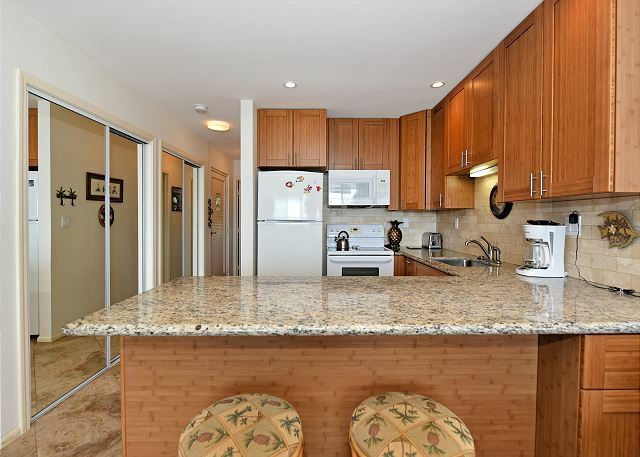 Unit #203 has a nicely updated kitchen and bathroom. Tile floors throughout are nice. No damp feeling carpet with the humidity we experienced. Kitchen is well equipped and there were sufficient spices to use. Loved the Belgian waffle maker. Bathroom needs a little more light. Found it a little difficult for shaving and makeup application. Nice walkin shower and counter space. Washer and dryer in the room is a plus. Also nice to have an elevator to haul golf clubs up.